I really like Kenton Sparks personally, and I enjoyed working with him a bit when he was at the University of North Carolina at Chapel Hill. Sparks was even gracious enough to thank me in one of his previous books (Ethnicity and Identity in Ancient Israel: Prolegomena to the Study of Ethnic Sentiments and their Expression in the Hebrew Bible [Winona Lake, Ind. : Eisenbrauns, 1998) for helping him get started on that work. I think that book still represents good scholarship. 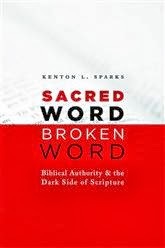 Unfortunately, I cannot say the the same for his recent book, Sacred Word, Broken Word: Biblical Authority and the Dark Side of Scripture (2012), though I give him credit for acknowledging that the ethical problems of the Bible are real. Otherwise, you can read my full review recently published in the Review of Biblical Literature.